Andy: As a low price choice in the coconut rum market, this is not one of my favorites. A little harsh with not much coconut flavor. After mixing with pineapple juice, it completely lost all traces of the coconut flavor. it wasn’t good by itself, and the coconut gets lost mixing it, so I would look elsewhere. Beachbomber was a good inexpensive alternative. Adrian: This was not as good as Beachcomber Coconut rum with a much more toned down coconut flavor. This has a strong alcohol flavor and with a lower alcohol content than it’s competitors. 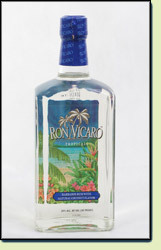 I use to find Ron Vicaro at Jewel, but now I can not find it any more. Why??? They have not had your rum for 3 weeks. Can you help?? I lovd this and used to get it from the Jewel Osco. They stopped carrying it. I cannot find it at Binny’s, Mareanos, Walmart, etc. Who carries this brand?